I’m very much a coffee drinker, but when I take time to relax and enjoy myself, I find that I opt for tea to soothe my system. It’s no wonder that other natural beauties I talk to offer up tea dates and write of spa days that involve a detox mask and a cup of calming brew. In just a matter of time, MIYU Beauty took this natural coupling and made it the foundation of its new beauty collection. With just four products launching this month, MIYU Beauty brings a feeling of sweet pampering to your next spa day. I absolutely love when beauty companies offer up trial sizes. 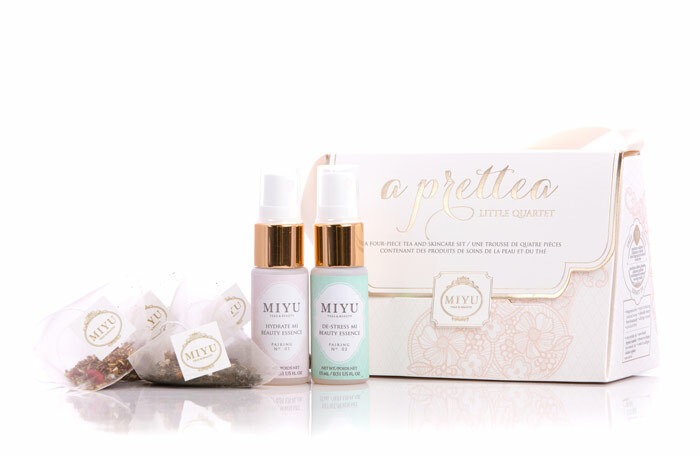 MIYU Beauty’s “A Prettea Little Quartet” is the perfect introductory kit to the line; it features four satchets of Hydrate Mi and De-Stress Mi Beauty Tea and two 0.51-ounce spray bottles of Hydrate Mi and De-Stress Mi Beauty Essences. As you may have seen via Instagram last week, I keep the De-Stress Mi Beauty Essence on my desk at work, spritzing it on throughout the day as I need it. I’ve noted this before, but I’m picky about my toners and hydrosols; they need to gently cover my face in a fine layer so as not to mess up my makeup and to just finely hydrate the skin. Beyond the delivery of the mists, I’m impressed with the texture. 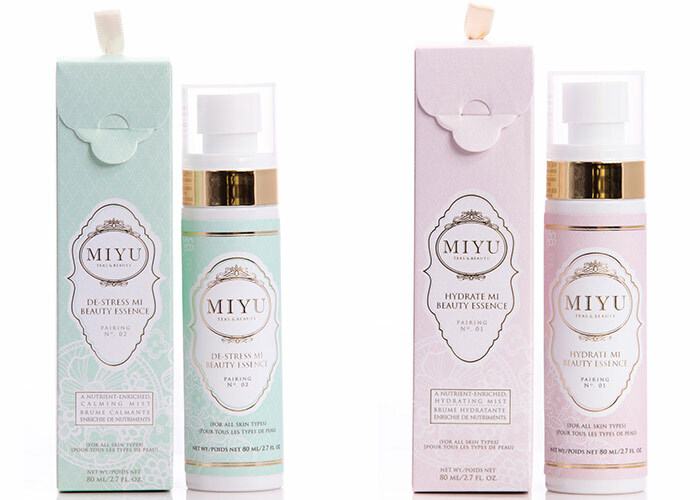 MIYU Beauty describes it as a “fusion between a facial mist and a serum,” and I couldn’t agree more. It’s got a little oomph to it without feeling sticky or watery. I can almost go without my daily face oil when I use this in the morning; instead I’ve found that I can use a drop or two less of my oils because of the hydration that these beauty essences deliver. I’m excited to see what else MIYU Beauty brings to market. Its founder, Connie Tai, worked behind the scenes in product development at Bliss Spa in New York (think Blood Orange + White Pepper bodycare, FatGirlSleep, FatGirlScrub and Tan For All Seasons products), so you can bet she knows her formulations and marketing. Yet it appears she’s also committed to creating a natural ingredient-based, holistic line that truly beautifies from the inside out. I wasn’t shocked at any of the ingredients in her debut beauty essences (yes, phenoxyethanol makes an appearance, as does polysorbate 20, but these score less than 4 on the EWG scale; I try to keep it to 5 or below) and appreciate that the not-so-clean ingredients are toward the bottom of the ingredients list. As for the teas, you really can’t go wrong. I’ve sipped on both of them and they are delightful; I have a thing for peppermint teas (and anything peppermint, really) that help me feel re-energized. The De-Stress Mi Beauty Tea delivers a smooth peppermint taste, thanks to the balance of chamomile, and I really love that both teas contain candied pearls — how glamorous is that? The Hydrate Mi Beauty Tea is quite impressive, with its antioxidant-packed blend of green rooibos, goji berries and rose petals as well as an additional shot of vitamin C from the goji berries. It has a soft rose scent and makes me feel more beautiful after every sip; it’s just so light and dainty! This is one I’d sip on as I relax in the bath full of dried herbs and rose petals, enjoying a deep mask and instrumental music. Absolutely pleasant. So, bottom line, would I buy anything from MIYU Beauty? While the teas are delicious and beautiful, the price is a bit steep. The beauty essences, though, truly intrigue me and I’m wondering how the nozzles on the full sizes differ from the travel set. If it’s not as targeted and more of a fine mist, it could be a win! I guess I’ll need to buy one to see. Order up! MIYU Beauty launches this month, and I’m hoping the extremely edited line expands quickly (I’d love to see a facial oil or aromatherapy products from this pamper-me line). It’s already landed in the Birchbox shop, which could send this Canadian startup skyrocketing to success. Have you heard of or tried anything from MIYU Beauty? What do you think of the concept and foundations of the line? Tell me in the comments section!